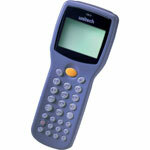 Basic Handheld Computers are the perfect devices for simple batch applications like retail inventory collecting. These devices do not have Wi-Fi or cellular capabilities and collect data into a simple text file. Basic mobile computers come complete with their configuration software and accessories making them an out-of-the-box solution for any business looking to just get started with Handheld Computers.